But just because you lose muscle mass does not mean it is gone forever. 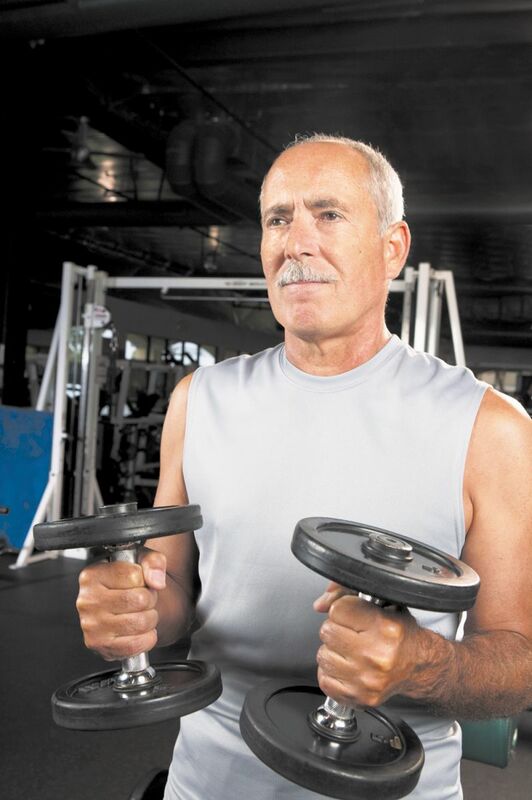 "Older men can indeed increase muscle mass lost as a consequence of aging," says Dr. Thomas W. Storer, director of the exercise physiology and physical function lab at Harvard-affiliated Brigham and Women's Hospital. "It takes work, dedication, and a plan, but it is never too late to rebuild muscle and maintain it." This constant challenging builds muscle and keeps you away from plateaus where you stop making gains. (See "Working on a PRT program.") In fact, a recent meta-analysis published in Medicine & Science in Sports & Exercise reviewed 49 studies of men ages 50 to 83 who did PRT and found that subjects averaged a 2.4-pound increase in lean body mass. Your diet also plays a role in building muscle mass. Protein is the king of muscle food. The body breaks it down into amino acids, which it uses to build muscle. However, older men often experience a phenomenon called anabolic resistance, which lowers their bodies' ability to break down and synthesize protein. Therefore, as with PRT, if you are older, you need more. A recent study in the journal Nutrients suggests a daily intake of 1 to 1.3 grams (g) of protein per kilogram of body weight for older adults who do resistance training. For example, a 175-pound man would need about 79 g to 103 g a day. If possible, divide your protein equally among your daily meals to maximize muscle protein synthesis. 1 cup of cooked beans (about 18 g). Protein powders can offer about 30 g per scoop and can be added to all kinds of meals like oatmeal, shakes, and yogurt. "While food sources are the best, supplemental protein can help if you struggle with consuming enough calories and protein from your regular diet," says Dr. Storer. Also, to maximize muscle growth and improve recovery, he suggests consuming a drink or meal with a carbohydrate-to-protein ratio of about three-to-one or four-to-one within 30 minutes after your workout. For example, a good choice is 8 ounces of chocolate milk, which has about 22 g of carbs and 8 g of protein. Building muscle is not all about strength, says Dr. Storer. You also need power. "Muscle power, how fast and efficiently you move, is more connected to the activities of daily living and physical function than muscular strength," he says. A good way to improve overall muscle power is with your legs, since they are most responsible for mobility. "Doing quicker movements against resistance, like one's own body weight, can be an effective means of developing power," says Dr. Storer. For instance, when rising from a seated position, try to do it quickly. When climbing stairs, hold the handrail and push off a step as fast as possible. "It does not have to be every step—begin with one to three steps—but this teaches your muscles to use strength in a more effective way." 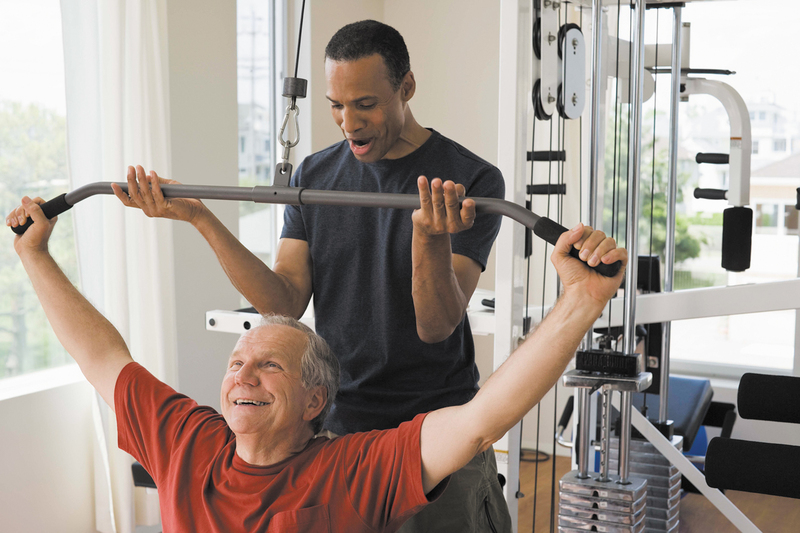 To gain more muscle mass, older men need a structured and detailed PRT program, says Dr. Storer. "It should be tailored to the individual with the goals being progression and improvement," he says. "It should focus on individual elements like specific exercises, load, repetitions, and rest periods, and should challenge but not overwhelm." Check with your doctor before embarking on any kind of strength-training routine. Then enlist a well-qualified personal trainer to help set up a detailed sequence and supervise your initial workouts to ensure you perform them safely and in the best manner. As you progress, you can often perform them on your own. two or three workouts per week. After you have established a routine, there are several ways to progress. The easiest is to add a second and then a third set of the exercises. Another way is to decrease the number of reps per set and increase the weight or resistance to the point where you are able to complete at least eight reps, but no more than 12. As you improve, you can increase weight by trial and error, so you stay within the range of eight to 12 reps.